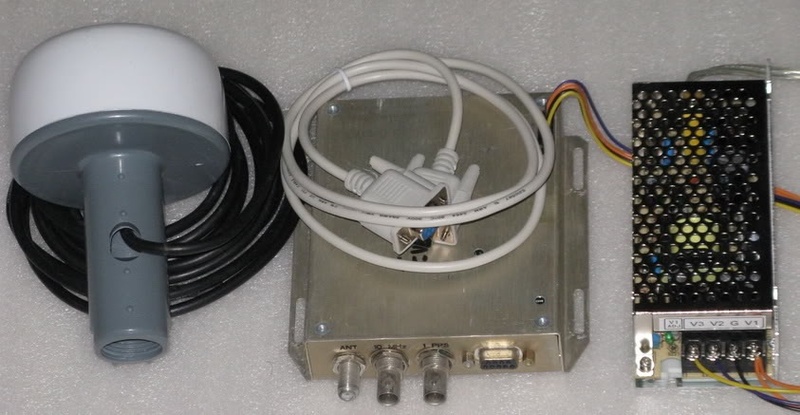 I have my SDR-14 receiver online, for some listeners to use. The other day, there was a logging of Trenton military aviation weather on 6950 kHz. I had not seen other reports of Trenton aviation weather on this frequency. And, since 6950 is a very popular frequency for pirate radio in the USA, this could cause some concern, as QRMing military stations is generally bad karma for pirates. Here is a recording of Trenton Aviation as received on the SDR-14. As it turns out, I had been running a recording of 6800-7000 kHz via another SDR, my netSDR. So I went back, and checked that recording at the same time the SDR-14 had picked up Trenton on 6950. Nothing. Nothing at all. And the netSDR is connected to a much better antenna than the SDR-14. Hmm. This is strange. Last night, I was alerted that Trenton was again being heard on the SDR-14 on 6950 kHz. So I went and tuned in on the netSDR, and again heard nothing. I then decided to look for a schedule of frequencies used by Trenton, and found that they should be on 6754 kHz. I tuned in, and sure enough, there they were. Coming in very well, about S9+30 dB or so. Hmm… I did a quick calculation, and the difference between 6950 kHz and 6754 kHz is 196 kHz. 196 kHz, that sounds familiar. Why yes, that’s the I/Q sample rate of the SDR-14! Images have been the bane of DXers for decades. They often manifest themselves as a particularly strong signal that is picked up on other frequencies. With an analog receiver, these frequencies are often offset from the actual frequency by the IF frequency of the receiver. With VHF/UHF radios and scanners, this is often 10.7 MHz, or close to that. In the case of the SDR-14, the image was located at an offset equal to the I/Q data rate. It was probably being heard on 6558 kHz (6754 kHz – 196 kHz) as well. If you’re hearing an unexpected signal, one suggestion is to try another radio, ideally one with a different IF frequency. If you don’t hear the signal on the second radio, then it is most likely an image. Or your other radio is broken. But it’s probably an image. Ask another DXer if they can hear it, as well. There’s a ham in Erie, PA that has been harassing the local club that runs a 2 meter repeater with claims of interference to the VHF marine band. The FCC has investigated, and found no interference. Multiple hams have contacted the Coast Guard and they have not had any interference issues. The only person who reports interference is the previously mentioned ham, who lives a few hundred yards from the building housing the repeater. I’ll close by noting that the VHF marine band is about 10.7 MHz above the 2 meter band frequency used by the repeater – 146.610 MHz. Shortwave pirate radio station Wolverine Radio was on the air last night, with their typical excellent signal, excellent audio, and excellent programming. As is often the case, they finished their show with a Slow Scan TV (SSTV) image. SSTV is a way of sending an image using audio tones. Here’s a video of the image, while it was being received. As you can see, it takes about 2 minutes to send a single image. Hence the name Slow Scan TV. This version includes a lot of new features, including recording I/Q data directly to disk, so you can then play it back. Think of it as a VCR. You can, for example, record the entire 43 meter band (6800-7000 kHz or so, depending on your SDR model) and then go back later and run the I/Q recording back through SdrDx again. It’s awesome! Previously I’ve had to run SpectraVue under vmware to do this, now I can do it natively on the Mac. I use a program I’ve written myself, that reads in the I/Q data file, and plots a waterfall for the entire file. I can then selectively demodulate what signals I want. I can record all of 43 meters overnight, then check in the morning to see who was on, and listen in. I don’t miss anything, nor do I have to choose if there’s two, or even three pirates on at the same time. I can listen to all of them. At some point I may release this for others to use (Mac OS X only) but it’s still pretty crude right now. There’s lots of other new features and improvements to SdrDx, so if you have an RF Space SDR, go download a copy to try out. Sunspot SunSpeck group 1452 has pretty much rotated out of view, taking the meager solar activity we’ve had with it. The NOAA/NASA/Space Weather prediction boys promise that we’re still a year away from the peak of cycle 24, and activity will increase. Go up. Yes, it will go up any time now, just you wait. Hey! Look over there! Global Warming! Meanwhile, back in the real universe, the background x-ray flux is at B1 levels. So what does all this mean for us DXers? The lower solar activity has several major effects. First, the highest frequencies that can be propagated are lower, in many cases much lower. During a solar cycle maximum with high activity, the higher bands are often open 24 hours a day. With the lower activity we’ve been having, this is not this case. Yes, 10 meters is still open at times, but not nearly as much, or with the good conditions that have been experienced in the past. So operators and listeners need to move down to lower frequencies. The foF2 frequencies are correspondingly lower, which means that a given band (including 43 meters) will go long earlier in the evening. Operators may want to adjust their schedules accordingly, and consider transmitting a little earlier to reach a semi-local audience. OTOH, they’ll end up reaching more distant listeners earlier in the evening as well. Second, D-layer absorption is lower, due to decreased x-ray flux from the Sun. This means that lower frequencies are not attenuated as much, which is a good thing, since in many cases that’s all that is propagating. The last few days, I’ve been hearing 48 mb (6 MHz) Europirates fade in as early as 2 hours before local sunset. And once the Sun does set, their signal levels increase to really strong levels. Likewise, US pirates such as Wolverine Radio have been reported across the US and into Europe with incredible signal levels. Third, the lack of major solar flares and coronal streams affecting the Earth means that geomagnetic conditions have been very stable. No geomagnetic storms means stronger signals, and less fading. The net result is that reception conditions for 43 meter band pirates has been extremely good lately. Lots of operators and listeners have been taking advantage of the excellent conditions, loggings are way up. There is a coronal stream expected to start impacting the Earth around the 13th or 14th of April, so we’ll have to see what effect, if any, that has on conditions. Until then, enjoy the great propagation! 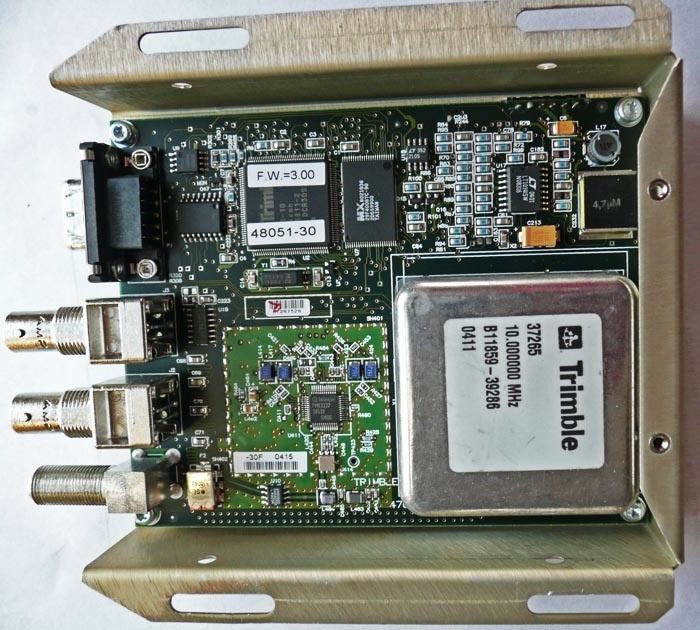 Software Defined Radios (SDR) have revolutionized the HF radio monitoring hobby. While most of the SDR manufacturers only offer Windows versions of their SDR application software, there are many third party solutions for other operating systems. 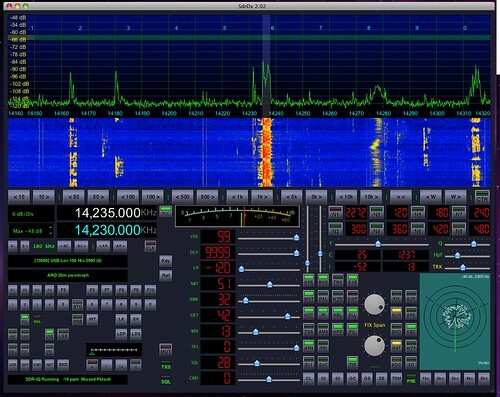 I use Macs, and there’s a great SDR app called SdrDx. It is based on the open source CuteSDR program (which fortunately uses the more permissive BSD license rather than the overly restrictive GPL license, allowing a much wider use of the code). SdrDx is free to download and use. SdrDx works with all SDRs made by RF Space. I believe it may also work with some soundcard based SDRs, although I have never tried it that way. As obvious by the screenshot (from a 24″ iMac) there’s a lot of controls. Besides the typical waterfall and spectrum displays, there’s also controls for memories and notch filters, as well as the ability to control the various AGC and noise blanker settings. There’s a readme file that comes with the download, and recent versions of SdrDx have an optional tooltip display, so you can hover the cursor over a control to find out what it does. The author of SdrDx is actively developing it, and has added quite a few features based on user suggestions. 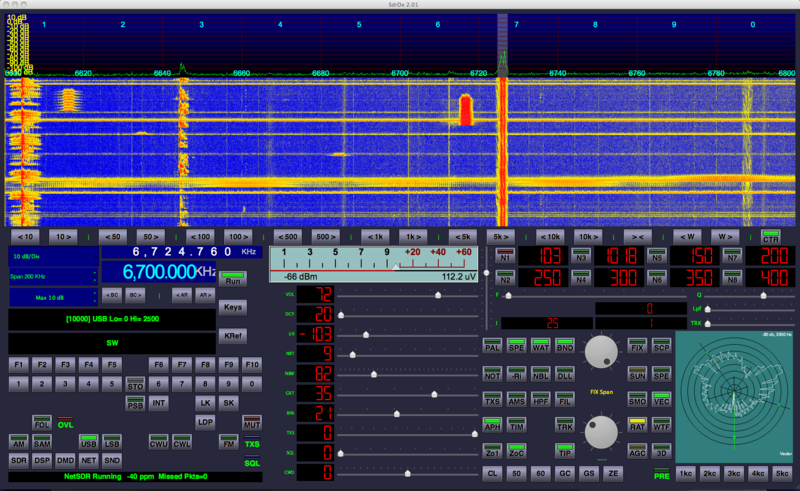 If you run Mac OS X, and are looking for an app to control your SDR, SdrDx may be the way to go. Download a copy and try it for yourself.